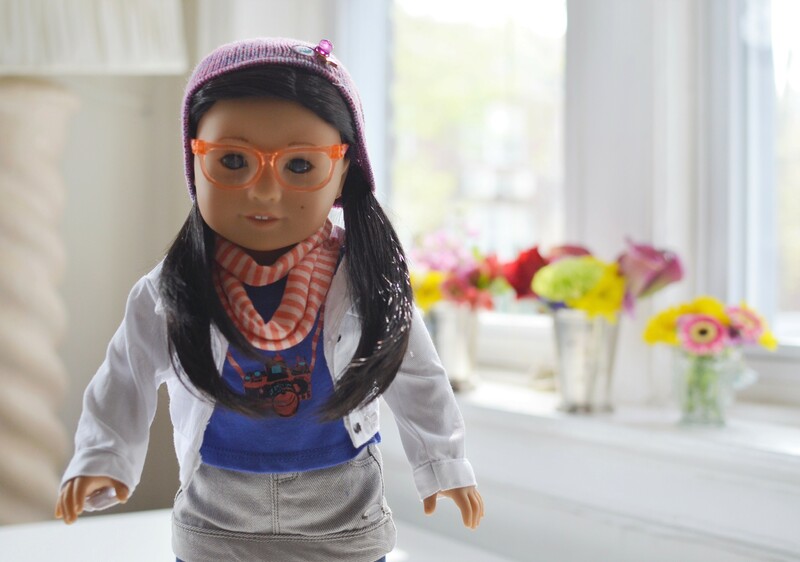 Introducing Z Yang: American Girl’s first Korean-American doll! 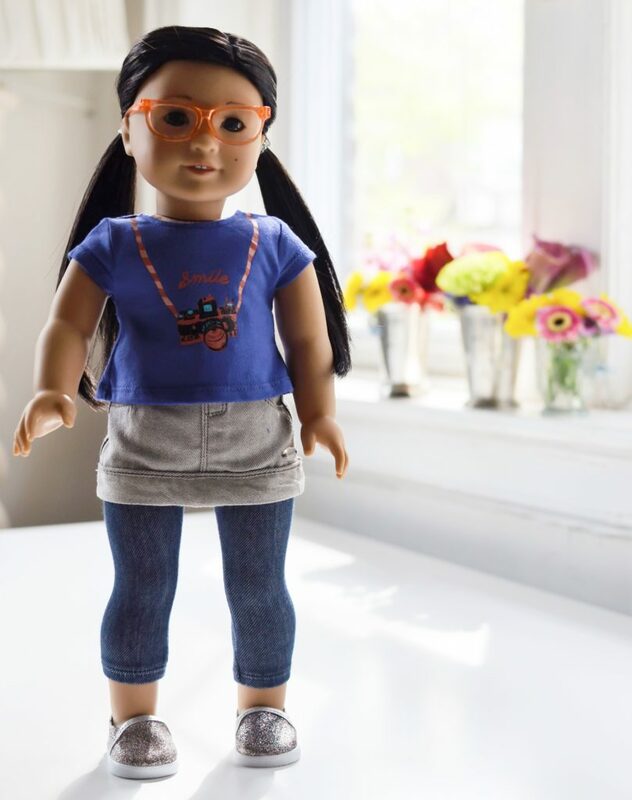 Z (short for Suzie) launched today as part of American Girl’s new line of contemporary characters – representing more diverse backgrounds and creative interests. This adorable doll is an imaginative young filmmaker from Seattle who loves to make stop-motion videos. She’s already racked up a ton of fans (hello, millions of views!) via her “Z’s Crew” web series on American Girl’s YouTube page. Z’s stop-motion vlogging adventures are told in a two-book series, The Real Z, and Z on location. She also has a line of fun accessories available for purchase including video making supplies and a cute accessory set with glasses. Inspired by Z, my kids gave stop-motion video making a go. Check out their first video below! Win It! American Girl is kindly sending a Z Yang doll + book to one lucky winner. Enter this giveaway via the below widget. Best of luck and thanks for visiting! Love the new doll! My girls would love her! My twins are excited for the Z doll. Z is a beautiful doll!! She has a fun collection, and I can’t wait to read her story!! Thank you for this giveaway, I would love to win this doll for my daughter!! So nice to see more diversity in the line! I love this! I love how they are exploring cultures to teach to others and I know my niece would really love this doll!! This American Doll is so sweet! I love it! I love this doll. She is adorable. Thanks for the giveaway. I just love these dolls and my granddaughter, Morgan has always wanted one. I think Z Yang is super cute. This dolls is definitely the prettiest American Girl doll I’ve seen. Would love to gift this to my little girl. This is a beautiful doll! I love the diversity and sweet face. What a beautiful doll! Love that they are branching out with more ethnic dolls and exploring more cultures and hobbies. All of the American Girl Dolls are so positive and I love the stories each of them carry! I would love to win this doll for my daughter fingers crossed ? I love that AG has an Asian American doll now. I’m excited to see an Asian background doll. She’s beautiful! My daughter would love this! I love that’s there’s a book and back story to go along with the dolls. Not a fan of the “permapanties” but otherwise nice to see diverse dolls. My daughter thinks she’s very cool with those glasses! OMG! This would be so amazing for my little girl. I love Z Yang! She is so cute and her story will be so awesome to read to my daughters! Love this doll! SO cute. She is a beautiful doll. She is beautiful! I love the diversity American Girl has. She is so cute! I would love her for my daughters. I just love her cute little camera shirt – how clever! Oh she is so beautiful! I love how much education each doll brings with them! Oh Kayla would love her! I love to see companies finally recognizing and acknowledging the differences between us. It’s not a bad thing, we are just unique. I’m always ecited when a new doll comes out. This would be a perfect addition to my niece’s American Doll collection. I love that she uses an initial for her name. My daughter is Miss B to those closest to her! It’s such a cute doll! Baby girl has been asking for an American girl- she’s at that age!!! This doll is super adorable I love her story! I love the american girl doll brand. The books are amazing, and i love that the company has started to expand so that every girl can find a connection with a doll. This giveaway is awesome. I was just surfing the AG site today, checking out the new Z Crew with our amazing middle daughter who turns 10 next month!!! A trip to the American Girl store is at the top of her wish list. It has been so fun introducing her to the dolls and their stories. My daughter would love the American Girl Z Yang Doll . She loves to make her own films. I glad The American Girl Doll Company is starting to diversify their dolls. I like that they came out with a boy doll, Logan too. Such a cute doll Z -Yang is love all of her accessories that go with her too. My granddaughter would love to own one of these dolls! She always wanted one. This is a fantastic giveaway for any girl. My goddaughter would love this! I am thrilled that they are releasing this doll and adding to the diversity of the collection. My girls like AG but we have never purchased anything for them, only allowing them to read the books. They would love to win this doll! Always love when a new doll comes out, this one is great! I love that they are making diverse dolls! American girl is always so fun! My IG is mrsbrockavich48, I entered it wrong in the rafflecopter and pushed enter instead of backspace. My daughter would enjoy this doll and would like to learn about creating stop-motion videos. My daughter loves American girl dolls, I had not seen this one before! My daughter is named Suzie, too, so she is super excited for this unique doll!!! Z is a beautiful doll that would teach my granddaughter. Z maybe teach her the film industrial. What a cute doll. My niece would have a fit over it. Very cute doll! My girls would love her! My daughter would love this adorable doll,she has always wanted an American Girl doll and doesn’t have one yet. Our girls sit and look at these dolls all the time, they love them. Ohhhhhh such a beautiful doll! My grand daughter would so love to win her! We have been long time fans of American Girl Dolls! We have a couple of generations of dolls! My kids when they were growing up and now my grandkids! I love that this company has spread its wings and open the door to other ethnic dolls! Collector items and fun friends for our kids! I love the American Boy doll also! 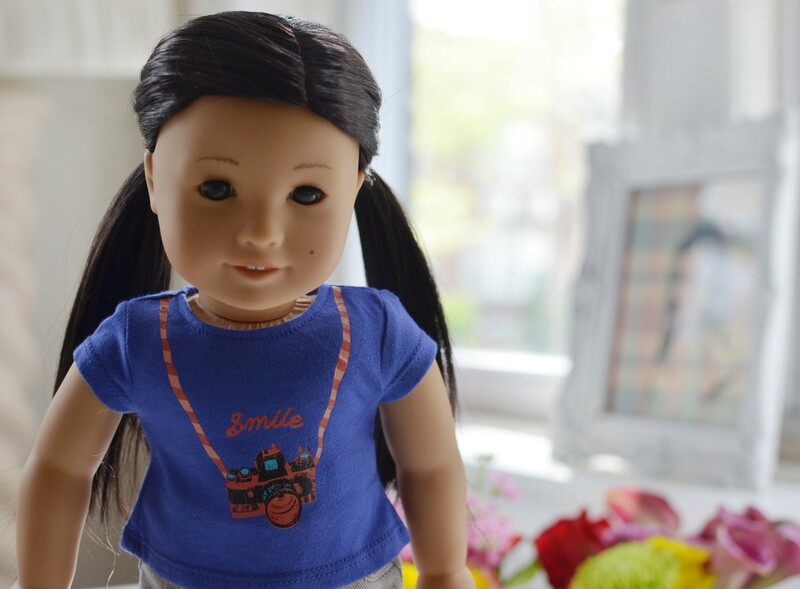 My granddaughter would love this doll – thank you so much for the chance! such a cute doll. my niece would love it. What a beautiful doll. My niece will love it. Thank you for the opportunity! the doll is so cute, my girls would love her! My niece is obsessed with American Girl, she would love this. What a cute new doll. My girls would love it! I absolutely love their new line…with all these fascinating backgrounds & occupations/hobbies!! Z is adorable…and obviously very smart & creative…a great role model for any American girl!! I would love to get my little girl an American girl doll. Thanks for the opportunity. She is so pretty. Love her story. My daughter would love playing with her. Very pretty – love the pigtails. I’m glad they finally have an Asian American doll; they used to have a Chinese American one but they retired her. This definitely fills a gap. My daughter has recently been super into American Girl dolls! She gets the magazine, but no dolls yet! this doll looks cool! What a beautiful doll! My girls would love her. oh my goodness so cute! My daughter would love her so much!! OMG!! Mad order has been wanting an American doll for so long. They are just precious. This is an amazing generous giveaway. Thank you so much for the chance to win. I love how much character this doll has! My toddler son would enjoy playing with her. All of the American Girl dolls are so inspirational it is so nice to see all the stories and cultures from each doll! So glad to see this addition to the collection. Love this new doll! Thanks for the giveaway too!! My daughter loves american girl! I love her little glasses! I have always loved American Girl dolls and books. I love her glasses it makes her look very sophisticated!! I have always wanted an American Girl Doll but now I’m a mom and my daughter wants one. I love that AG is adding some more diversity to their girls. Thank you for the opportunity!! She is so cute! I would love to have her! I love her cute little glasses! What a cute doll! Love the creativity that goes into them & the stories. What a beautiful doll! I think she has such a special face and I love the blue t-shirt with her coloring. My granddaughter would absolutely love this doll! Z Yang is a beautiful doll and a nice addition to American Girl dolls. I love Z Yang’s long dark silky hair, she is so beautiful. My granddaughter will love her. Love that AG continues to broaden their offerings to other nationalities! What a cute AMG doll. My granddaughter would truly love this. Lovely doll, would be a blessing as a birthday gift. My daughter is from Taiwan. We get so excited when we see an Asian doll, because most of the dolls out there don’t look anything like her. We would really love to win this. My daughter would love this doll! And I love that the dolls “grow” with the times and are diverse and unique- unlike Barbie. My daughter would like this doll because it looks like her! my little one would love this doll ! American Girl is doing a really good job growing their diverse dolls. Not just in ethnicity, but also in jobs/hobbies. I love the diversity of American Girl dolls. Thanks for the chance to win. Adorable doll! My daughter would love her! My niece would love this doll, so cute! I have 3 granddaughters who love any and everything AG! We are excited for this new doll! My 6 year old Samantha would love this! Thank you for the in depth review and information on these beautiful dolls. I have been considering purchasing one for each of my nieces but have not had the opportunity to look into the quality, etc. of these dolls. Reading your blog on a regular basis has made my job so much easier! I will be purchasing a doll for each of them for Christmas this year. Thanks, also, for the amazing giveaway opportunity! Hey there! I am following on Twitter, but hit the enter key before I finished entering my name. It is @PaulineRMilner. I hope you see this comment and that it does not cancel my entry. Sorry! I see it and no worries at all Pauline! Good Luck! I have 3 grand daughters that would love to have this doll. Thank you. She has beautiful features. I love how unique each of the AG dolls are. She is adorable!! I love that she is a filmmaker! Thank you for the giveaway! I love all the different options offered now. My daughter has one of the American Girl Dolls. It would be neat to get the doll a sister! She looks fun and creative – my daughter would love her! She’s soo cutie! My daughter would love that she wears glasses just like her and has the same long dark hair! We love American Girl! I would love this for my daughters. I had the Samantha doll when I was little. My daughter would love this doll! She’s has been wanting an american girl doll forever. i love that each doll has a story to go along with them. thanks for the chance! This doll looks most like my daughter. I really like that she can pose easily. I love this new AG doll and that they offer such a diversity within their dolls now! I would absolutely love to win this for my daughter’s birthday. Thanks for the chance. My niece would adore this doll.I love everything about her. She is just beautiful and I like everything AG does. My daughter has just now gotten to really understand the stories of American Girl Dolls, and I love that this doll is multicultural, and that she would be old enough to learn more about her story! i love that they are making a doll that is about filming. She would be perfect for my daughter who loves to run around taking videos of everything and everyone. This would be amazing for my kids! I love her glasses- reminds me of my daughter. Thanks for the giveaway. I love everything about American Girl, such a pretty doll! My mom would love to own an American Girl doll, so I hope I can win Z Yang for her. My mom is retired and sews matching outfits for little girls and their AG dolls. She would love to be able to dress her up. My daughter is now in her mid-20s, but we had so much fun together when she was young, reading AG doll books. They are doing such a great job! I love your blog too and you’re a great writer. Thank you so much! I would LOVE to win this and give her to my Korean-American niece! I love this doll and my daughter would be so excited to have her! My granddaughter would love her! I grew up with AG dolls – it’s so much fun to see the selection grow and grow. I love the diversity of the AG dolls. My granddaughter would love her. My cousin would like this, thanks for the chance. I LOVE the American girl line diversity. I adopted a little girl from Timor-Leste and it’s SO incredibly hard to find a doll with her unique background. She always wants a baby that looks like her, but stores usually only carry Caucasian or African-American dolls. And Asian dolls are usually stereotypical, they assume a Chinese doll works for all Asian children, but saying a Chinese doll works for my Timorese daughter is like saying a Spanish doll works for a German girl. I love it too. Thanks for visiting Athena. It’s about time that we had some diversity in dolls for our young girls! My granddaughters are obsessed with playing dolls right now, this doll would make a great new addition! I love the American Girl dolls. I’ve always loved that they are so diverse. Thanks for the chance to win. My grand daughter loves American Girl and she would love this! She is so cute! My niece would love her. Thanks for the opportunity! very interesting. my daughter is almost old enough for one! She’s adorable! Our three year old daughter would love her! I love the new contemporary dolls and their interesting hobbies. I think it’s really cool that she relates back to the web series too. My niece will love this doll! She is gorgeous!! My daughters would love this doll! I love that this is such a tech savvy young woman! Lovely giveaway – thanks for the chance to win! My daughter loves Z. She has dolls of all races, Z would be a great addition to her collection. I love American girl dolls, they empower little girls. My niece loves the American Girl dolls, and my own daughter had one when she was young. Such a great line! My granddaughter would love to get this American Girl doll. American Girl is getting so creative with their doll choices! My daughter would love this so thanks for the chances to win. I love that these dolls are getting more diverse. What an adorable doll. My cousins would have loved her when they were little. I’m sure their daughters would love her now. It used to be so hard to find dolls in the US of different ethnicities; I love that it is more common now. My niece would love this doll. I really love American Girl Dolls. I enjoy the books. I’d love to win this doll for my niece. My niece would absolutely love this doll! I am so excited each year when I see the new American girl dolls! My daughter would love this! OMG……..I know the PERFECT little girl to gift this to! This is a beautiful doll! I love the story behind her. Thank you for hosting the giveaway! My daughter is a big American Girl fan! Amazing giveaway. My daughter would love this doll. If I was ever lucky enough to win this I would gift it to my daughter. She is all about American Girl. Thanks for this chance..
My niece would be thrilled. Lovely precious doll. Thanks for the wonderful chance 🙂 very generous. Good luck everyone. I love this doll. I know my girls would love this doll. I had Molly when I was little and I would love to win to share with my little one! Thank you!! This will make my daughter very happy to win. my daughter would love this doll, she is so pretty! I would love this for my sweet niece! She would be her favorite! She is gorgeous. I would love to win her for my daughter. My daughter would love this doll! My daughter would love to have one of these American girl dolls! So awesome to see a new doll come out. She is sooo unique. Would love to win her. Thanks for the chance.